Do you suffer from blackheads or abscesses on your underarms, groin, buttocks, inner thighs or breast? If you do, you might be having a rare skin disorder called Hidradenitis suppurativa (HS). Learn about this condition and inform yourself about its causes, symptoms, diagnosis and treatment. 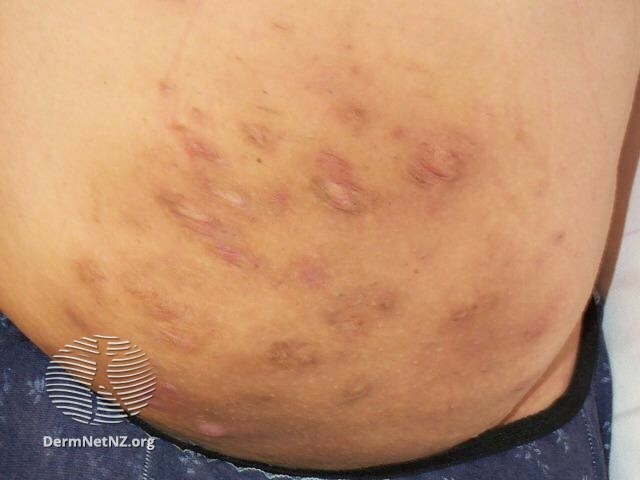 1 What is Hidradenitis suppurativa? It is a chronic skin condition of the hair follicles and the skin regions containing sebaceous glands or apocrine sweat glands. It is characterized by the development of red, tender lesions and/or blackheads. The ICD 9 Code for this disorder is 705.83. The disease reportedly affects 1% of the general population. In the U.S, its prevalence is between 1-2% of the total population. The condition is said to affect females more than males. Severe cases of this disease are quite rare. But when mild cases of this disease are taken into consideration, 1 out of 100 individuals may be seen to suffer from HS. In industrialized countries, the disease has been found to have 0.3-4% prevalence. HS usually develops following puberty or during the end of the teenage years of a person. The nodules that develop due to this condition are painful and swollen in appearance. These tend to rupture after sometime, releasing pus and fluids from within. Even after they heal, the abscesses can leave ugly scars on the skin thus ruining the smooth appearance of the body. In the early stages, the nodules present themselves as solitary and painful nodules. However, these may also arise in more than one regions of the body at the same time. The lumps may persist for weeks and even months, causing much pain and discomfort in sufferers. Some people, particularly those with multiple nodules, suffer much due to HS. Others only experience mild symptoms. Stress, hormonal changes, excess body weight, excessive perspiration or heat may also worsen this problem. The condition is often believed to arise due to a blockage of a sweat gland under the skin region where an HS nodule is found to develop on. The blockage may occur due to skin secretions, sweat or sebum released from the sebaceous glands. When the sweat fails to escape to the skin surface, it goes deeper into the adjoining tissue. An obstruction of hair follicles on a particular skin region may also give rise to the problem. When germs, such as bacteria, that usually reside on the skin surface get trapped in the blocked follicle or gland, it continues to multiply. This occurs as warm, moist environment is conducive to bacterial growth. Growth of bacteria in the tissues gives rise to inflammation and even infection at times. This ultimately leads to the formation of a nodule over the skin surface. In some people, the sweat glands fail to develop in a proper way. This is also believed to result in improper release of sweat into the skin surface. Instead, the sweat moves deeper into the surrounding tissues and becomes responsible for the development of skin lesions. In some cases, the condition is also believed to be associated with disorders like Graves’ disease or Crohn’s disease. The diagnosis of HS involves observation and examination of the skin of patients. This is preceded by asking patients about the symptoms and an analysis of their medical history. If doctors notice pus or drainage, they may obtain a fluid sample from the released contents and send it for laboratory tests known as cultures. Cultures may be essential for ruling out presence of serious dermatological conditions, like Tuberculosis of the skin. Although scans (such as MRI or CT scans) are not needed to diagnose the disease they might be used in the treatment of very severe cases of the disorder. These can help the direction where the sinus tracts go and their depth in the body of patients. A surgery can be planned accordingly. If there are symptoms of infection, swabs might be taken to check which germs are multiplying in the pus. This can help determine whether or not antibiotics should be used and which ones are apt for treatment. Such diagnosis may also aim at differentiating the disorder from ingrowing hairs, common boils, skin infections and abscesses that it is often confused with. Tests might be necessary to tell apart HS symptoms from those caused by such conditions. In some cases, an analysis of blood glucose (sugar) levels should be done to check whether the patient is actually suffering from diabetes. This is because people with diabetes are more prone to skin infections. During differential diagnosis, doctor might also recommend blood tests to check the level of inflammation or infection and also to make sure that the person is not anemic. Although there is no specific treatment for this disorder, early cure can help manage its symptoms and prevent development of new nodules. The nature of medical treatment used for HS depends on the extent to which areas have been affected. It also depends on whether the sores are infected or painful. Mild cases of HS can be cured with the help of self-management that includes regularly washing the region with an antibacterial soap and applying warm compress over it. Minor cases may need medicinal treatment in the form of topical application (which have to be rubbed on affected regions) or oral medications (which have to be taken through the mouth). Antibiotics, when taken for a long duration in the early stages of the disease, can help fight bacterial infection. It may also prevent outbreaks of the disease in future or stop the condition from worsening. These drugs help stop functioning of the oil glands by prevent the blockage of the hair follicles. These are effective in reducing pain and inflammation occurring due to this disorder. These may help decrease swelling, particularly in the initial stages of the disorder. These medications are effective for short term treatment of HS. There can be risks involved with long-time use of these classes of drugs. This involves ablation of skin and flesh over any tracts or tunnels to reduce scarring and promote healing. This is useful for removal of lesions or promoting drainage in a single, small skin region. It involves skin grafting or directly closing skin flaps to remove entire affected skin. Although surgical treatment helps cure the condition in a single region, it is unable to prevent its recurrence in multiple spots. Wearing tight-fitting synthetic clothes may irritate the skin and give rise to nodules over the body. Loose-fitting under-wears and clothes can help prevent irritation of skin and also help air-dry the skin. Gently washing the affected region with an anti-bacterial soap and applying an over-the-counter topical antibiotic medication on the area can keep the spot clean and disinfected. Although the effects of smoking have not been clearly established on HS patients, cessation of the habit has been believed to improve the course of the disorder. Excess body weight may cause a number of regions of the skin to rub together, such as between the folds, and lead to friction, excessive perspiration and growth of bacteria. Although weight loss is not known to cure HS, it is believed to improve its symptoms. Shaving can irritate the skin region and worsen the problem. It is better to stop shaving until the nodules heal completely. Females are found to be three times likelier than males to suffer from this disease. Although Perineal involvement is more common in men, Inguinal, Axillary and Submammary involvement is observed more in women. The disorder commonly arises in teen years or at the end of puberty. In many cases, the nodules of HS are found to arise in people aged between 20-30 years. Dark skinned people have more apocrine glands than whites and it is probably due to this reason that African-Americans tend to suffer more from this disorder. People with a history of acne are more susceptible to this disease. People who smoke cigarettes are at greater risk of developing this ailment. People suffering from disorders such as diabetes can be more susceptible to the condition. It is also said to have a higher incidence in those who have undergone Lithium therapy. People who have higher body weight are more susceptible to this disease. The less-common complications include acute infections and limited movement due to a deposition of scar tissues (Fibrosis). In rare cases, a form of skin cancer known as Squamous Cell Carcinoma, can occur. In some cases, the lesions caused by this ailment tend to recur. The nodules are mostly observed to recur in the same region and result in chronic sinus formation. This is accompanied by intermittent discharge of blood or serous fluids. If you suspect yourself to be having Hidradenitis suppurativa, seek immediate medical attention. As aforementioned, an early treatment can help manage the symptoms of HS and prevent formation of new lesions. It can also help you avoid complications and live as normally as possible.